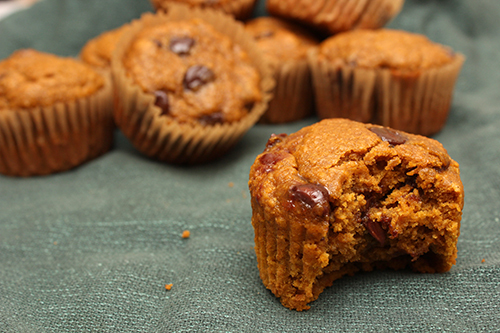 All bakers freak out about pumpkin season. We just go crazy, clamoring to buy cans of pumpkin purée. Check out the recipe for “Pumpkin-Oat Muffins,” from the September/October 2018 issue of Eating Well. There’s no flour and no butter, but hooray we have chocolate chips. You get to grind “oat flour” in your blender, which makes you feel crafty and clever. “Pumpkin pie spice” is another of the coveted flavors of this season. I used my “apple pie spice,” which is the same difference. Cinnamon and nutmeg and allspice are warm and cozy scents. I opted to bake 11 regular-size muffins (rather than mini), for 18 minutes. These muffins are soft, with lots of chocolate chips. Thank you, chocolate. Next week, I’ll cook savory again. I want to make the “Seared Scallops with Sweet Corn and Bacon Sauté,” from the October/November 2018 issue of Fine Cooking. This will feel nice.